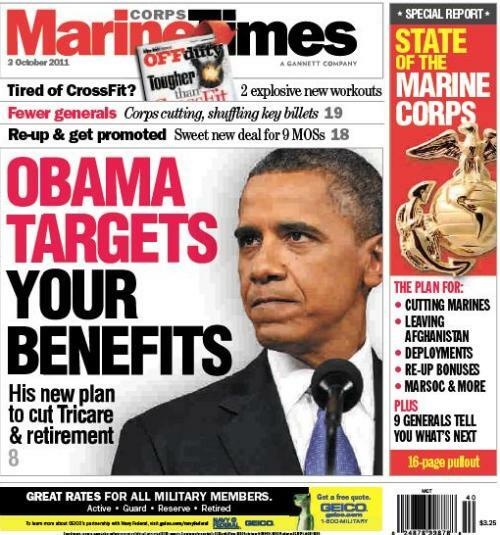 This week’s Marine Corps Times offers some serious double-barreled action. The main cover story outlines a new plan President Obama unveiled Sept. 19 that could cut Tricare and retirement benefits as part of a broad initiative to cut the federal deficit by $4.4 trillion. It’s something you’ll likely hear a lot more about in the future, considering the president also called for the creation of a commission that could recommend widespread changes to military retirement. That’s one major piece of news. This week’s issue also offers a special report featuring a 16-page pullout section aimed squarely on explaining the future of the Corps. Nine general officers sat down with Marine Corps Times for the issue, including Commandant Gen. Jim Amos; Lts. Gen. Robert Milstead, Richard Mills and Steven Hummer; and Maj. Gen. John Toolan, the commander of Marine forces in Afghanistan. Collectively, they outline the service’s pending drawdown, the future in Afghanistan and what operations could look like after the war. Check it out on newsstands now, or subscribe here to read it now. Let me see if I,understand this correctly. Obama want’s to attack retirement and health benefit’s of all military personnel. So that he can reduce the national debit. Has this individual totally lost all his marble’s. How can those who set in Washington DC,even go there and ask of those who have given so much already to give up the one thing they earned by giving service to their country. There are still many veterns living,that didn’t have a choice of whether they wanted to serve or not. Because we where drafted. So if you really want to cut the national debit. Let’s start with reducing your pay checks to half of what you make now and allow no pay raises for the next 20 years. It is far past the time,that those in goverment and run this country tighten their belt’s up. Instead of asking the little man to suffer the blunt of all their blunders. Keep in mind the President, your Commander in Chief is giving the DOD an open option to come up with our own retirement plan. I don’t agree with the current proposal to change retirement of existing service members and neither do the President, Secretary of Defense and many other politicians. If you don’t like it then VOTE and call your congressman. If you didn’t do either than don’t complain. The proposed plan by the Defense business Board has its ups and downs. Good for service members who don’t plan to stat 20 years but bad for those who do and whom have deployed several times knowing that there is a light at the end of this long hard road we walk.